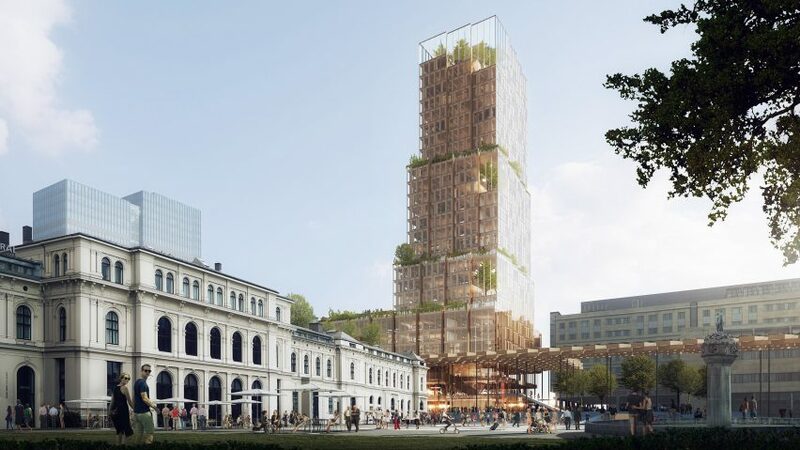 CF Møller Architects and Reiulf Ramstad Arkitekter have teamed up to design a tower at Oslo's central station, which will have a telescopic form to facilitate plant-covered terraces. Named Nordic Light, the building will contain a concourse for travellers in its base and offices above. 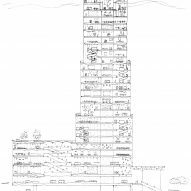 At 110 metres high, the tower will echo the height of two nearby buildings to become one of the tallest structures in the Norwegian capital. CF Møller Architects and Reiulf Ramstad Arkitekter saw off competition from 24 other teams vying for the contract, including Bjarke Ingel's firm BIG. Designed to provide better connections between various modes of transport, the project will also involve re-landscaping the surrounding area. The installation of a wooden pergola at its base will help guide passengers towards the station entrance. The 45,770 square metres of floor space within the tower will be spread out across four stacked blocks, which decrease in scale towards the top. Plentiful windows will flood the office levels with light. Meanwhile larger panes will encase atriums planted with trees, and display the building's concrete and timber framework. Planting will spill out onto a series of terraces and continue beneath the latticed pergola. Broad flights of steps descending from the walkway to a plaza will double as a resting spot. The Scandinavian firms – CF Moller headquartered in Aarhus, Denmark, and Reiulf Ramstad in Oslo – are working with engineers from Bollinger Grohmann and Transsolar on the project, which is expected to begin in 2020. In the nearby governmental quarter, Regjeringskvartalet, Nordic Office of Architecture and Haptic are preparing to build the new Norwegian government headquarters, which was damaged during a fatal terrorist attack in 2011. On the outskirts of the city, Haptic is involved in another major project – a new aquarium that will be the centrepiece for the wider waterfront transformation of a former airport.